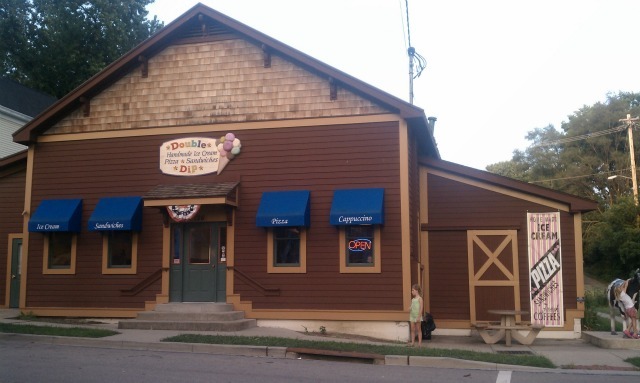 When you look up the word quaint in the dictionary, there’s a little asterisk that refers you to Lebanon, Ohio. Lebanon, Ohio is the epitome of quaint with its small town charm, enticing main street (actually on Broadway) that is filled with antique shops, boutique stores, ice cream parlors and the historic Golden Lamb. I really enjoy visiting Lebanon but recently we found a hidden gem tucked away on a quiet side street near the trains. If you’re looking for a delicious place for a cool treat, then visit Double Dip Ice Cream (126 S. Cherry St.). They’ve got flavor after delicious flavor of handmade ice cream just waiting for you. They also serve pizza and sandwiches. The 1880 building just beckons you to enter and there’s a life sized metal cow named Scooper out front who is the perfect mascot. I tried the Raspberry Chocolate Chip, S opted for Cookies & Cream with sprinkles and K had her usual standby of chocolate soft serve. Both S & I loved our ice cream – it was so creamy and there were so many flavors to choose from that I definitely want to return (Peanut Butter Fudge, Tiramisu, Espresso, Root Beer Float to name a few). The soft serve was a bit too soft and had to get served in a dish with a cone on top but K didn’t seem to mind and gobbled it up. Double Dip has a nice patio space out back to enjoy your ice cream or you can head upstairs and play Foosball, or one of the two arcade games. There is also a nice party room on the second level. On the first level, they have a Jukebox where you can play some tunes. If you have younger kids, all these options can seem a little overwhelming, I know our larger group got a little over stimulated and management had to ask us to settle them down (so sorry!). Lebanon has so much more to offer for families. 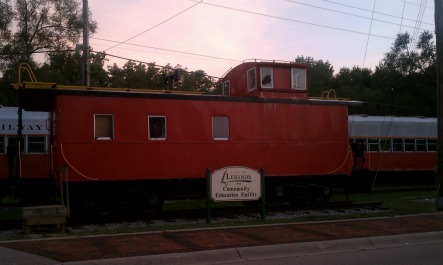 One thing that is on our “must do” list is to take a train ride on the LM&M Railroad (Lebanon Mason Monroe Railroad). They offer family friendly themed train rides throughout the year. Coming soon is their Train Ride with Clifford (Aug. 13 & 14, 20 & 21, 27 & 28). They have a variety of train departures and the fun includes the train ride, a 45 minute stop over at the LM&M Junction, story time, visiting with Clifford and making a craft. Prices are $18.50 for adults, $15.50 for kids (5-16) & seniors (62 years and up), $8.50 for toddlers (2-4), and free for infants one year and under. In September, A Day out with Thomas is on the schedule. You can also hop aboard for a one hour train ride during the Lebanon Country Applefest on September 24 (tickets are only $13/adults, $8 for kids & seniors, $5/toddlers). The Lebanon Applefest is a free festival from 10am-7pm and it is filled with entertainment, family fun, delicious food, crafts and more. Close to Lebanon, there are also some great farms to visit. 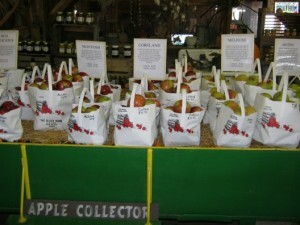 Last year, we did our 2010 Farm Fest Tour or Bust in the Fall, and we’ll do a repeat performance this year. Some of the local farms you can visit are Schappacher Farms, Marvin’s Organic Gardens (Fall Festival is Oct. 15), Irons Fruit Farm, Hidden Valley Fruit Farm and one of my favorite smaller places is the Black Barn. I hope you’ll get a chance to visit Lebanon, Ohio one day soon. Kristin, Manna Cupcake typically posts their daily gourmet makings on the Facebook page, so you can have an idea of what’s available. That said, getting there late in the day might leave you disappointed. Hi Bill, thanks for the tip. I will have to check them out on FB and now that my girls will be going back to school, I might just have to get some girlfriends to head up to Lebanon with me. Thanks for your kind words too – so glad you are enjoying FFC. Have a great weekend. This is a nice article, but someone needs to fix the its/it’s error on the teaser on the front page of Cincinnati.com. Also, I know this isn’t a typical news article, but the title should really be in AP style (sentence case, for starters). This is an online newspaper, or it isn’t. Thanks so much. I’ve fixed the error. 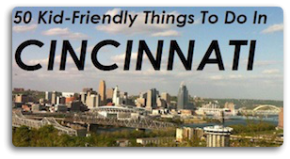 Family Friendly Cincinnati is an independent blog and the the blog posts are all written by 11 local Moms in Greater Cincinnati. Thanks for reading Ms/Mr Brunner. We’re not an online newspaper and therefore we do not adhere to AP style standards. Our feed is picked up by The Cincinnati Enquirer and cincinnati.com through our partnership with them. This website is a resource for parents to learn more about all that Cincinnati has to offer to families. This is a labor of love for our writers. I love Lebanon. Spent a lot of time there this summer. The best thing about Lebanon is Whit’s!! Best ice cream!! I had a espresso toffee chip that was to die for. Also, can’t forget to mention Lebanon’s hidden treasure, the Lebanon Theatre Co. Also, you have to watch the movie Milk Money. It was filmed there. I did see Milk Money a long time ago – had no clue it was filmed in Lebanon. Looks like Whit’s is going to be our next trip. Thanks Laura! Don’t forget about Manna cupcake cafe and the Golden Turtle chocolate shop!